We’re so excited about this gig! 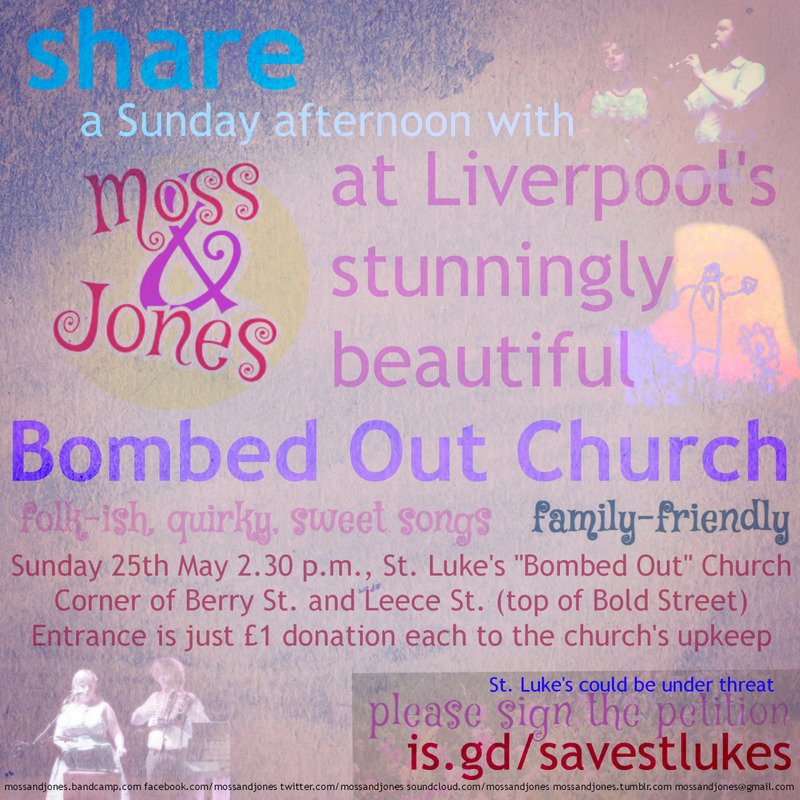 We’re going to be playing Liverpool’s Bombed Out Church on Sunday 25th May, starting at 2.30p.m. We’ll be playing two twenty minute sets with a break in between so you can stretch, chat, wander, eat your butties, or just sit and look up at the sky. We’re planning on adding another song or two to our repertoire before then (including a well-known mediaeval folk song; we just love singing in Middle English!) so even those of you who’ve heard us a few times will be able to hear something new! One of the most wonderful things about this gig is that children can attend too. We know very well how hard it can be to get to gigs when you have childcare to arrange (or you simply don’t like spending too much time apart from the little ones) so this time… you don’t have to worry; bring them too! All our songs are family-friendly and we’ll even sing a lullaby. Just a little note; do be careful with crawling babies and toddlers to keep them away from the pond in the middle of the church! It’s a pound each to get in, but every penny of the money will go towards the upkeep of the building. While you’re about it, please take a moment to sign the petition to save St. Luke’s. You may have heard on the news that the future of the building could be uncertain. We adore St. Luke’s. We’ve been to many gigs and events here and also we are planning to get married here too later this year. It’s something of a shock to us that one of the plans involves turning St. Luke’s into a fancypants “wedding venue”, given that people already get married there just as it is. We don’t need a roof and a snazzy “hotel” to persuade us to get hitched there; it’s already perfect! So, if you can come, fantastic! Please share the news of the gig everywhere. If you can’t - never mind, there will be other gigs - please share this everywhere because someone else might love to come!